Gavin Massey says the Wigan Athletic family will give Nathan Byrne all the support he needs after being subjected to racist abuse on social media. A 20-year-old man from Sheffield handed himself in at Blackpool Police Station on Saturday evening and was subsequently arrested on suspicion of a racially aggravated public order offence and malicious communications. In the light of recent high-profile events involving Raheem Sterling and the England side in Montenegro, Massey says enough is enough. 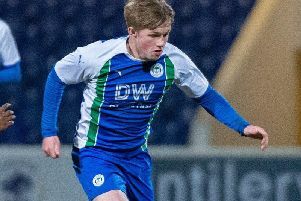 “It’s something we shouldn’t be talking about in 2019...it’s crazy this is still happening,” he told the Wigan Post. “We’ve seen it being highlighted at international level, what’s been going on. “Then to see it at the weekend, for something so petty, it was ridiculous to be fair. “As much as it’s a big thing, you can’t pay too much attention to it – because it’s just a few small-minded individuals. “Not everyone in the world thinks like that obviously, you can’t bracket everyone together. In this case it just looks like some boy lost his accumulator – and that’s his reaction. Massey admits there was a sense of ‘shock’ on the team coach home from Bristol as the enormity of the incident began to sink in. But he is adamant Byrne is strong enough to handle the situation – with the support of all around him. “Nath’s Nath, you know what he’s like, he just gets on with it,” Massey added. “He doesn’t want any fuss, it won’t get him down or anything. “But the rest of the boys are being so supportive of him, everyone at the club. Meanwhile, ‘Kick It Out’ has called on Twitter and other social media companies to do more to stamp out racism. “We have long campaigned for social media companies to take swift and decisive action against people who use their platforms for hate speech,” a spokesperson said. “Twitter says abuse and harassment has ‘no place’ on its site but it is obvious there really is a place for it there and in our view the problem is getting worse.